OS X comes with some powerful and useful tools for taking screenshots. Here's how to master them. If you’re relatively new to the Mac, you may not realize that OS X comes with a full suite of screenshot tools. Apple did a good job at hiding them, but once you know how to use OS X’s screenshot feature, it might just become an indispensable part of your workflow. Let’s take a look. The easiest way to take screenshots on OS X may be to use one of the following keyboard shortcuts. A screenshot of the entire screen. Using Command-Shift-4 lets you grab a screenshot of a portion of the screen. Once you press this keyboard shortcut, the mouse pointer will turn into a crosshair: Click and drag the mouse over the area of the screen you want to capture, then release the mouse button. A screenshot of a window. Note how OS X preserves the drop shadow beneath the window while removing all additional background clutter. Mouse over the window you want to capture then click it, and OS X will save a screenshot of just that window, without any of the usual background clutter. Normally, OS X saves screenshots to your Desktop as PNG image files, but if you just need to copy and paste a screenshot into a document without saving it to a file, hold down the control key in addition to the shortcuts noted above. For example, if you want to drop a screenshot of your entire screen into a Word document, press Command-Control-Shift-3, hop over to your Word doc, then paste the screenshot where you want it. Sometimes, you need a few seconds to stage a screenshot—or maybe whatever you’re taking a screenshot of requires you to have both hands on the keyboard. 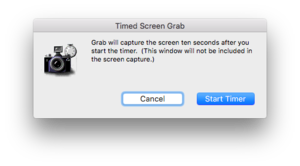 Whatever the circumstances, OS X’s bundled Grab app comes with a timer feature that will snap a screenshot after a ten-second countdown. OS X’s bundled Grab app makes it easy to take screenshots on a timer. Open the Grab app (look in the Utilities folder or search for it using Spotlight). Next, go to Capture > Timed Screen. A small window will pop up, informing you that Grab will... grab... a screenshot ten seconds after the countdown starts. Once you’re ready to go, press Start Timer. After ten seconds, Grab will do its thing and snap a screenshot, then show you the results. If it looks good to you, save the screenshot then quit Grab. Grab also lets you take other kinds of screenshots, such as screen grabs of the whole screen or of specific windows, just like the aforementioned keyboard shortcuts. I generally find the keyboard shortcuts to be more handy, but feel free to try and take screenshots using both methods. And that’s all there is to it! The best way to learn OS X’s screenshot tools is to use them, so play around with them and get a feel for what each of the different functions does.